Charlie Wyatt is a freak. He has trouble making polite small talk to anyone, let alone to a girl. But he sets his sights on Gloria, a girl he sees in a coffee shop one day. He’s going to chase her down and tell her she’s pretty – because what could be wrong with that? Gloria Aboud is a freak magnet – to the point that she carries around a notebook to write down all her freak encounters. Other girls thank Gloria when she’s around, because it means less freaks they have to deal with. But then Charlie happens. He’s a certified freak, yes, but why does she feel strangely drawn to him? FREAK MAGNET starts out fresh and funny and then offers up a surprising amount of depth. Because Charlie and Gloria are not just the freak and the freak magnet, they are also both dealing with some pretty heavy family issues. Because they are both pretty messed up and in need of help, it’s kind of wonderful that they find each other – even though Gloria does her best to push Charlie away and Charlie does his best to freak her out with his freakiness. Just how much of a freak is Charlie? Well, he’s the type that tells a pregnant woman (a stranger) looking for formula that she should breast feed her baby because formula has been tested with dangerous amounts of lead. He has no internal filter whatsoever, so he just blurts out whatever he’s thinking, no matter how inappropriate. Customer service is not his forte, so it’s a surprise that his boss at the drugstore he works at let him stay. But it’s a good thing for the reader, because the scenes at the drugstore are hilarious. And there’s a scene between Charlie and Gloria on the roof in the rain that gave me absolute chills it was so touching. Charlie and Gloria are some of the most real characters I've met in awhile. And I'd definitely go to a party with them, especially if Charlie's friend Edison and Gloria's sister Maggie came too. So yeah. Read this one! FREAK MAGNET is available now in hardcover. Find out more about it at the author’s website. Loved loved loved this book! i totally get what you mean about expecting it to be just a fresh funny story, but it's not just that. Definitely one of my favourite reads of 2010, maybe even ever! I loved your review on GoodReads. Just "liked" it! Great review! I have tough getting to read anything on a whim these days, but I would make an effort for this one. I even love the title. I'm going to have to chase this one down at the library. Nice review, Lenore! I looooved this one too. Charlie is such a dork and so cute at the same time. I don't know how he pulls it off. 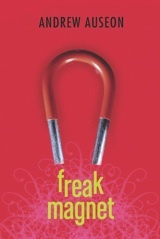 I am dying to read Freak Magnet! From what I hear, there is a dinosaur debate, and I am always up for a dino debate. Also, Charlie sounds like someone I may have met in college. So yay for a great review, Lenore! Put this one to the top of my wish-list. I'm trying to read more YA contemp and this sounds great. Do you ever watch The Big Bang Theory? Charlie Wyatt sounds a lot like Sheldon, and I love Sheldon, so this book sounds like a must for me. I think freaks are pretty interesting people, actually, and I am sure that this is a book I would love. By the way, I also loved Please Ignore Vera Dietz, and thank you for passing it along! Okay, I think I can relate to this book - strange people are drawn to me for some odd reason that I've never been able to figure out, because it's certainly not for my looks. I rarely read an Internet review that makes me want to read a book, but this one did. Since my writing has two characters who are considered freakish in the midst of a definitely anti-freak culture, maybe that intrigues me too. Ooh, I really want to read this. For once, it's not about the "hot dude", but the strange boy who blurts things. I love the synopsis. Thanks for the review! Thanks for the great review, might try this one. This sounds fantabulous! I love eccentric characters, and I can identify with the lack of filter problem. Great review! the review sounds funny and i adore the cover! you have it listed under YA--are the characters youngish? did i miss that in the review?